Unfortunately a woman may not have the option to decide if “fighting is for her or not.” When dangerous and life threatening situations present themselves a woman must be ready to act and do whatever it takes to defend herself and her loved ones. Fighting is definitely not for every girl but defending herself is a right and an obligation! Be ready! And do it in a fun, friendly and safe environment. 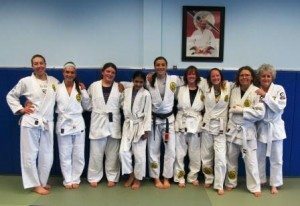 Only school in NJ offering a women’s program taught by women for women! These classes are exclusive for women of all ages, sizes and backgrounds! At Gracie New Jersey Academy, our group of women enjoys a specialized class that brings the best of our Self-Defense program allied with the best of our Sport Jiu Jitsu program challenging participants to a great workout that will not only help them to get in their best physical shape ever but also to feel empowered, strong, confident and assertive on their day to day lives. Q- How old must a girl be to attend classes? A- Adult classes are open to girls age 12 &older. The majority of women currently participating are ages 16 to 55 years old. They are daughters, mothers and grandmothers! The diverse range of ages in the class allow for a dynamic interaction among all participants and this exchange has been proved to speed up and facilitate the overall learning process. Girls younger than 12 years old are encouraged to attend this program with their mothers and/or relatives. They are also welcome in our youth co-ed classes. Q- I have never trained in any martial art before and I have not worked out in years. I feel quite out of shape. Is it still possible to attend your classes? A- YES!!! No previous experience is required. Your desire to learn and to get in shape is all you need. We will guide you every step of the way and assist you in reaching your fitness goals. Q- I am overweight. Shall I lose weight before attending your classes? A- NO!!! Don’t wait to lose weight. Let us assist you in developing an active and healthy lifestyle that will support your weight loss goals. Q- What shall I wear for the classes? A- The kimono or Gi is the traditional uniform used in this class. Sports bra, shorts, t-shirt /rash-guard under the kimono is required. If this is your first class, simply wear something comfortable and we will lend you a uniform for the day. 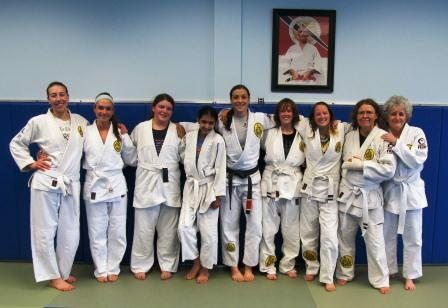 Q- Can girls come to the other Gracie Jiu Jitsu and MMA classes you offer? A- YES!!! Girls and women of all ages are welcome to all our other classes. All girls currently attending the co-ed classes can testify to the respect, camaraderie and support from our team of students and instructors. 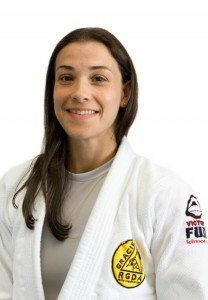 Q- Is it safe for girls to train Gracie Jiu Jitsu or any other programs you offer? A- YES!!! At Gracie NJ Academy SAFETY always comes first. All training is done in our carefully planned environment under the guidance of our qualified and experienced instructors.